Catch guest speaker Jane Dia at this weekend’s Science Sunday! Jane will share her RARE Pride Campaign – “Piti Pride Tepungan Wide” and the progress she’s made to engage users of the Piti Bomb Holes Marine Preserve. Learn more about the importance of community involvement in natural resource management, especially marine resource management, in order to sustain our community now and well into the future. After all, these natural resources are part of the island’s cultural identity and heritage. Whether its spreading awareness by sharing what you learned about coral reefs, participating in tree planting or monitoring – any involvement can help encourage the rest of your family and our community to “pay it forward” and be better stewards of our island home. See the flyer below for more details. Watch this video to learn more about “Piti Pride, Tepungan Wide” campaign in a coconut shell! 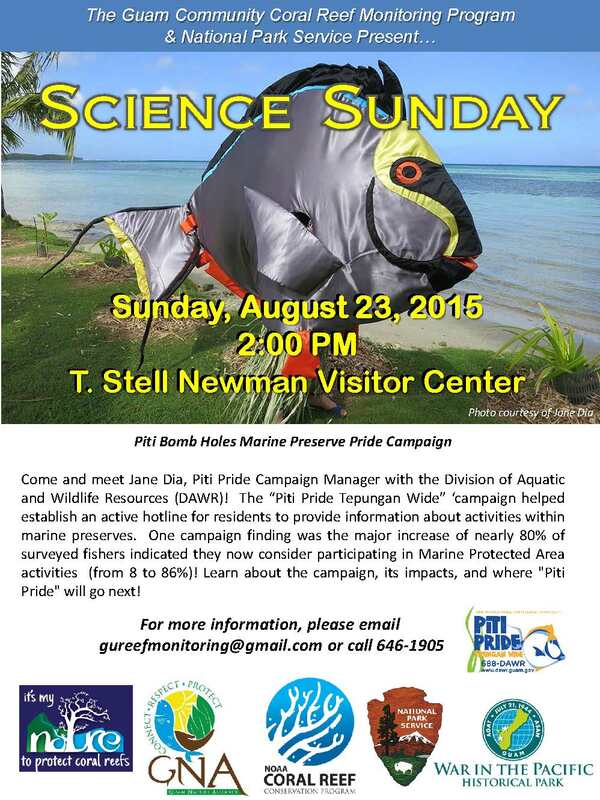 Video produced by University of Guam’s Sea Grant Program. Previous National Coral Reef Management Fellowship Program – JOB OPENINGS! Next It’s a R.E.E.F Celebration!